ASE certified technicians providing a wide range of auto services. Whether you drive a Toyota, Honda, Chevy, Ford, Dodge, or Nissan, we have the automotive expertise to keep your vehicle running at it's best. In addition to servicing most Foreign & Domestic vehicles, we have extensive experience in Diesel Trucks. Now Offering Alignments & Smog Testing! In addition to providing regularly scheduled maintenance services, we also offer repair services listed below, however we can't list them all. 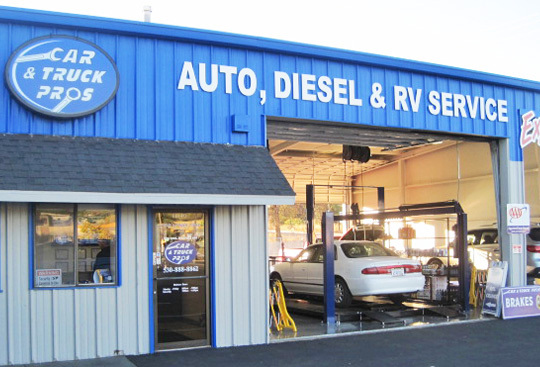 If you have a particular problem with your RV or just have general questions about your particular make of automobile, don't hesitate to give us a call. Car, truck, and RV Tire Sales & Service! Regular Scheduled maintenance includes Multi-Point Inspection, & Tire Pressure Check.